View this sample resume for accounts receivable, or download the accounts receivable resume template in Word. Do your skills put you on the receiving end of job offers? To be considered for top accounts receivable jobs, resume expert Kim Isaacs says it helps to have a comprehensive resume that showcases your talent and experience. 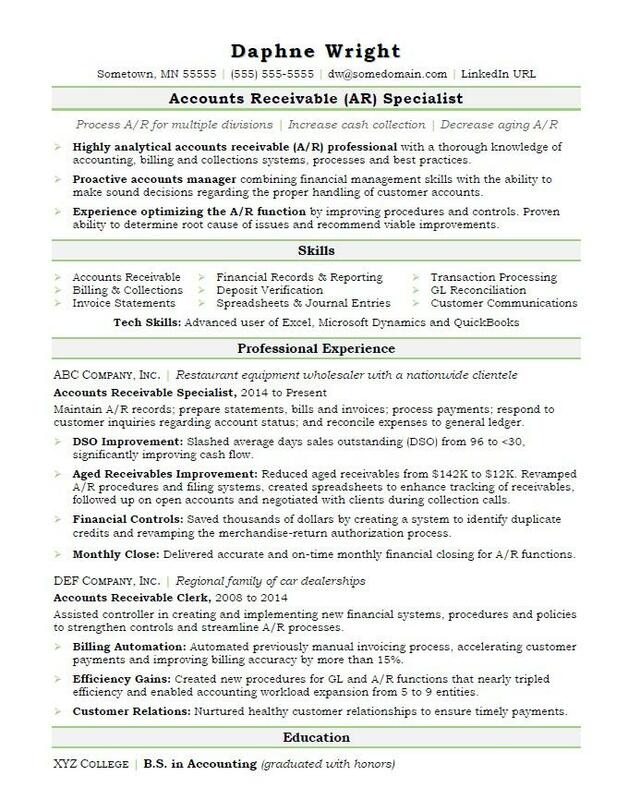 For resume writing tips, view this sample resume for accounts receivable that Isaacs created below, or download the accounts receivable resume template in Word. It also helps to know where the largest demands for your skills are. According to the Bureau of Labor Statistics (BLS), you'll find the highest level of employment for this job in the following states: California, Texas, Florida, New York, and Ohio; and in the following metropolitan areas: Dallas, Los Angeles, Atlanta, Chicago, and New York City. As an accounts receivable worker, you can expect to earn a median wage of $35,330 per year, or $16.99 per hour, according to the BLS. Additionally, you can search for accounts receivable jobs on Monster. Highly analytical accounts receivable (A/R) professional with a thorough knowledge of accounting, billing and collections systems, processes and best practices. Proactive accounts manager combining financial management skills with the ability to make sound decisions regarding the proper handling of customer accounts. Experience optimizing the A/R function by improving procedures and controls. Proven ability to determine root cause of issues and recommend viable improvements. Maintain A/R records; prepare statements, bills and invoices; process payments; respond to customer inquiries regarding account status; and reconcile expenses to general ledger. DSO Improvement: Slashed average days sales outstanding (DSO) from 96 to <30, significantly improving cash flow. Aged Receivables Improvement: Reduced aged receivables from $142K to $12K. Revamped A/R procedures and filing systems, created spreadsheets to enhance tracking of receivables, followed up on open accounts and negotiated with clients during collection calls. Financial Controls: Saved thousands of dollars by creating a system to identify duplicate credits and revamping the merchandise-return authorization process. Monthly Close: Delivered accurate and on-time monthly financial closing for A/R functions. Assisted controller in creating and implementing new financial systems, procedures and policies to strengthen controls and streamline A/R processes. Billing Automation: Automated previously manual invoicing process, accelerating customer payments and improving billing accuracy by more than 15%. Efficiency Gains: Created new procedures for GL and A/R functions that nearly tripled efficiency and enabled accounting workload expansion from 5 to 9 entities. Customer Relations: Nurtured healthy customer relationships to ensure timely payments. When it comes to collecting what's owed to you, we're pretty sure you know what you're doing as an accounts receivable clerk. But are you as confident in your resume-writing skills? Could you use some assistance? Get a free resume evaluation today from the experts at Monster's Resume Writing Service. You'll get detailed feedback in two business days, including a review of your resume's appearance and content, and a prediction of a recruiter's first impression. Let the experts at Monster show you how to strengthen your resume and put your best professional foot forward.